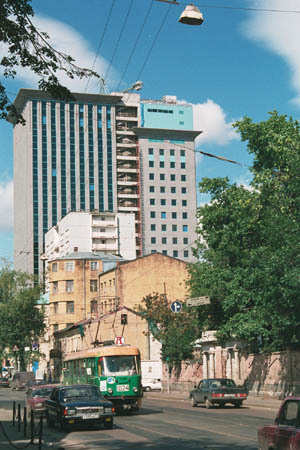 This is Zatsepa Square. 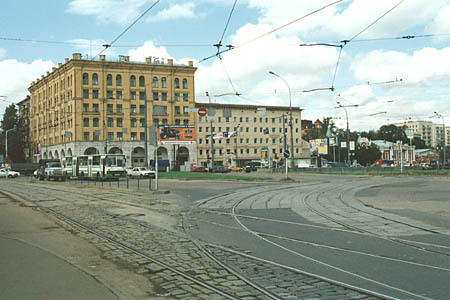 The tracks to the left lead to Novokuznetskaya Street, and right turns a line to Novospasskiy Bridge; that line was put in service again on October 27, 2000 after reconstruction of Novospasskiy Bridge across Moskva river. 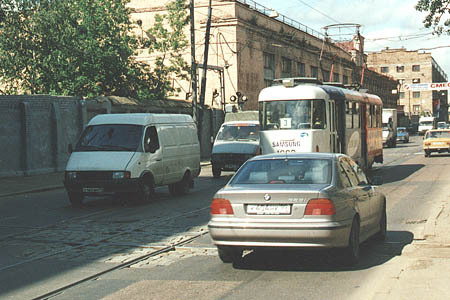 Decades ago, Dubininskaya Street had a number of railway level crossings, but now just one of them is still in use; and another one is still in the street, but railway tracks have been cut off. 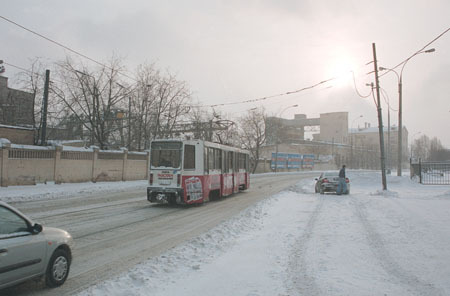 Dim rays of the winter sun make their way through the clouds while this tram approaches the end of Danilovskaya Street at its crossing with Danilovskiy Val, where the gloomy industrial landscape almost unexpectedly changes to solemn mediaeval walls of St. Daniel monastery.